Listing: Not surprisingly for an originally grade II* listed building, now upgraded to Grade 1, the official listing goes on for pages about this church but it is almost entirely descriptive. Comment: This ancient foundation defines the centre of this ancient town. Its architectural history is as complex as its religious and institutional history. Anthony Perry has kindly provided the following account, which is based on his entry in Wikipedia (where further information, including that on services and other matters, can be found). 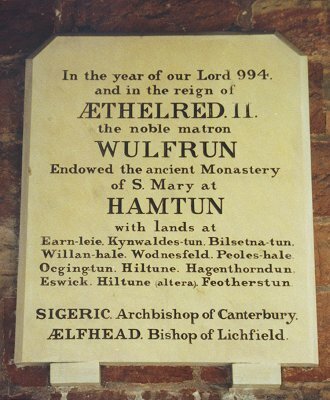 Whilst there is a tradition that King Wulfhere of Mercia was involved in its beginnings, Charter evidence reveals that an earlier Church was re-founded as a Minster in AD 994 by Lady Wulfrun (the Latin form is Wulfruna), who was believed to have been the grand-daughter of King Aethelred I and Queen Aethelflaed (daughter of King Alfred the Great). In AD 985 King Aethelred II (Aethelred the Unrede) granted to Wulfrun ten hides of land at Heantune. It is believed that Heantune (or High Settlement) later became known as Wulfrun's Heantune, hence the name Wolver-hampton. In AD 994 Wulfrun gave land at several places for the endowment of the Minster Church which she re-founded. This stone tablet in the porch records the original endowment of the church. 994 is often taken as the date of the foundation of the town itself, though the actual date is, of course, uncertain. But the city takes its name from the benefactress Wulfrun, it is Wulfrun's High Town. The names of the places granted to the monastery contain many local names which still survive. 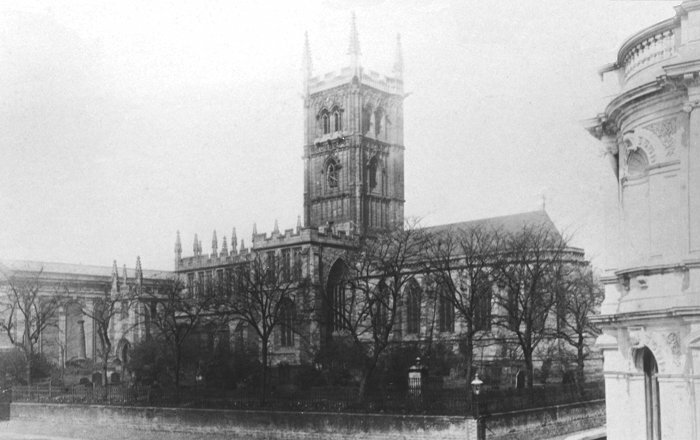 The church was, until 1846, a Royal Peculiar outside the jurisdiction of the Diocese of Lichfield. 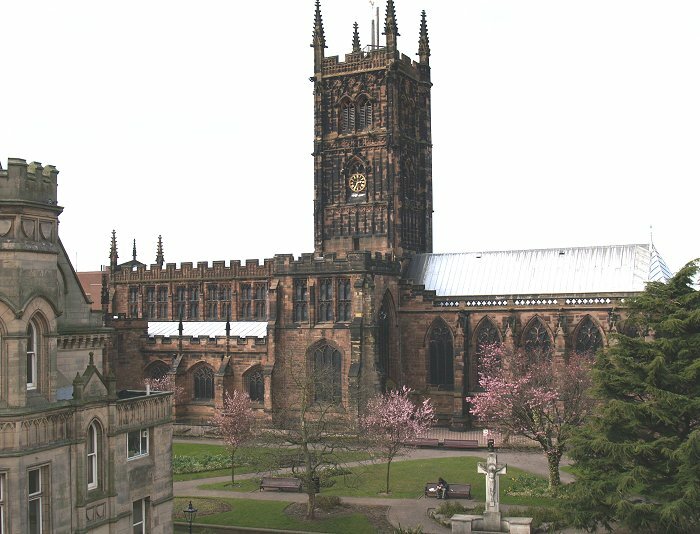 It was under the authority of the Dean of Wolverhampton, who had seven Prebendaries to assist him, representing other settlements looking to the Minster as their Mother Church. The original dedication was to St Mary, and this was changed in mediaeval times to St Peter. An attempt was made by the Dean in about 1200 to replace the arrangement by the building of an Abbey Church, which was commenced, with several monks being installed; but this was cancelled and the previous arrangement was put back in place. 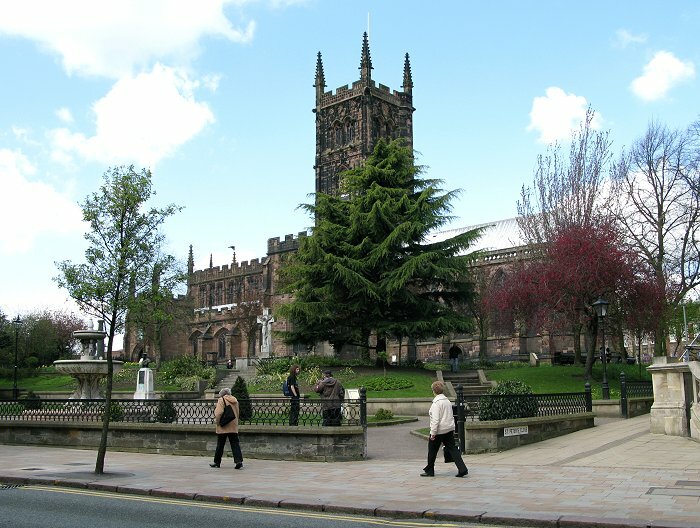 The Dean’s control of the town of Wolverhampton, which grew as a result of the wool and cloth trade, is highlighted by his obtaining a Charter in 1258 for a weekly Market and Fair, and in 1263 the creation of the Deanery Borough. From 1480 the church was linked to the Deanery of Windsor, the two positions being held by the same person. Since 1846, the church has been a parish church in the Diocese of Lichfield and its incumbents entitled Rector of Wolverhampton. The church seen from an upper floor of the buildings in Lichfield Street. 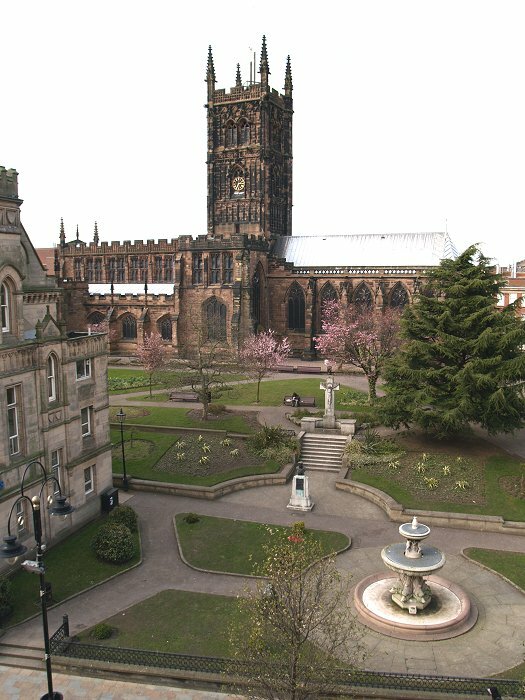 St Peter’s Church is built of red sandstone on an elevated site in the centre of the City. The oldest part of the building above ground is the crossing under the tower, which probably dates from the beginnings of the Abbey in 1200, followed by the Chapel of Our Lady and St George (Lady Chapel). Much of the Church was rebuilt and extended in the 14th century, in a Decorated style. However, the Church was to be substantially altered in the middle of the 15th century at the expense of the Town’s Wool Merchants, with the addition of a clerestorey to the nave. The upper part of the tower was rebuilt from about 1475 to a height of about 120 feet, and the Chapel of St Catherine and St Nicholas (Memorial Chapel) was completed at the end of the 15th century. 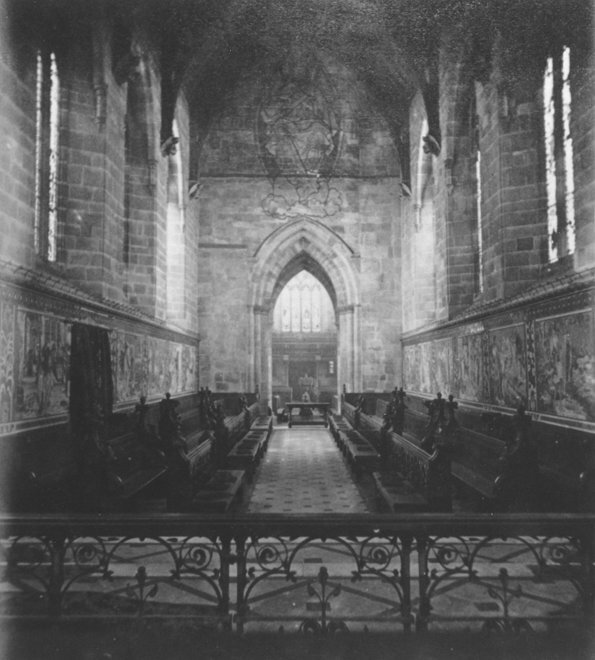 The chancel is Victorian, having been reconstructed in the 1860s to replace a chancel which was out of keeping, and this followed a substantial restoration in the 1850s by Architect Ewan Christian. 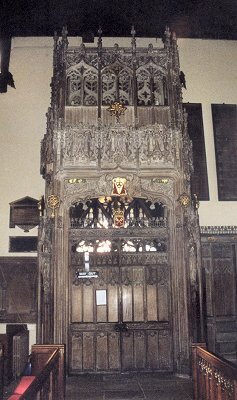 Unique features include the stone pulpit with a carved figure of a lion at the foot of the steps to protect the Minister; the font dating from 1480 with several carved stone figures; and the west gallery dating from 1610, paid for by the Merchant Taylors’ Company for use by the boys of Wolverhampton Grammar School. Near the south porch is a 14 foot high stone column, carved in the 9th century with birds, animals and acanthus. It may have been a column pillaged from Roman Viriconium and brought to Heantune, either as part of a preaching cross or as a memorial. The carvings have deteriorated but a cast made in 1877 can be seen in the Victorian and Albert Museum in London. The stone pillar. Some sort of Saxon date is attributed to it but there has been a vast amount of speculation about it and much ink has been spilt on it. 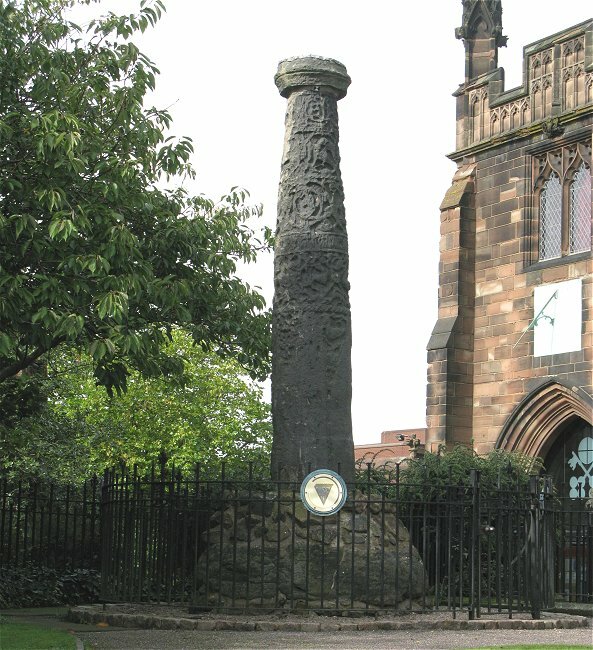 There are two other Saxon crosses in the city but only their bases remain - one at Upper Penn and the other at Bushbury. The three-manual Father Willis organ, built in 1860, is particularly notable. A campaign to raise £270,000 towards its restoration was launched in 2008. The restoration work, designed to return the organ to its former glory after the wear and tear of near-daily use and an inglorious re-build in the 1970s, is due to be completed by Principal Pipe Organs of York. There is a strong choral foundation in the English cathedral tradition: more than 70 children and young people are involved, along with Lay Clerks and choral scholars. The church has a fine set of bells - the second oldest complete set of twelve in the country. The bells are rung twice weekly. The rest of these notes are by Frank Sharman and Bev Parker. The black and white photos below are previously unpublished and belong to the church. They appear here by the courtesy and generosity of the Rector and with the willing assistance of the vergers. We also thank them for permission to take our own photos of the interior. Cheapside in about 1900. The church's hilltop position gives it extensive views over the surrounding countryside, reflecting one of its probably original functions - bringing Christianity to a still pagan area. The town market was founded on High Green, now Queen Square, just to the right of this photo. In Victorian times the market moved, but still close to the church. The building on the left is the old Retail Market and to the left of it was the open market patch. This very early photograph shows the graveyard facing Lichfield Street and, at the west end of the church, the old Exchange Building. Most of the graveyard is now replaced by St.Peter's Gardens. Another very early photograph, taken from the gallery at the west end which was built for the boys of the Wolverhampton Grammar School. 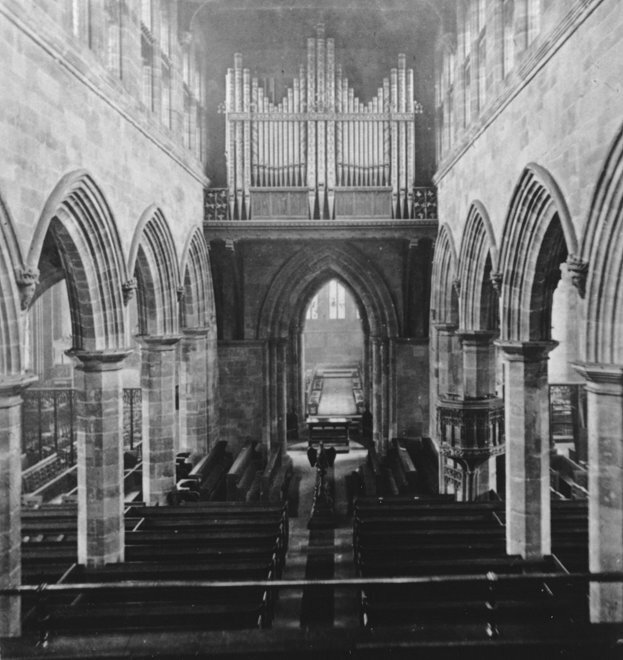 This early photograph is of the nave. It is just possible to make out the wall paintings which adorned the walls behind the choir stalls and above the arch. Today the chancel looks more than a little different. The interior of the porch at the south entrance. The interior of the church is notable not only for its overall architecture but for many interesting features within it. This is a fine statue of Admiral Leveson. There is a fine tomb with recumbent effigy. There are many other interesting memorials around the church. Marble tablets adorn the north wall, brass tablets the south wall - and there is a window containing touching memorials to children. "An old St. Peter's boy" refers to the fact that Charles Grant would have been a pupil at the church's St. Peter's School, which was once not far from the west end of the church. It still flourishes, but elsewhere in the town. This engraving was made before the 19th century replacement of the chancel and well before the Exchange was built just below the west end. In the engraving above you can see a window above the doorway. This is the window to a room which, it is said, was used in earlier times by a priest who looked out for merchants coming from the market to church, so that he could then leap into action for the immediate provision of their religious needs. A further example of the church's interest in the town's commercial activities is provided by the "Bargain Stone" which stands in the grounds. This is an upright stone with a hole right through it. It is said that bargains made in the market were sealed by the merchants shaking hands through the hole. But the reality of the thing is that it is an old and much worn gargoyle. A more certain commercial connection is provided by the fact that, in pre-reformation times, the church had a chapel dedicated to St. Loe, (alias St. Eloi or St. Elegius) the patron saint of metal workers. This is an early recognition of the importance of metalworking to the town. There is an excellent guidebook to the Church, available from the church. The church is open daily. Go there. Look at the Church. Buy the guidebook. You will also be able to buy Anthony Perry's carefully researched booklets on the Church. The new bookshop by the vestry door stocks many local history books. 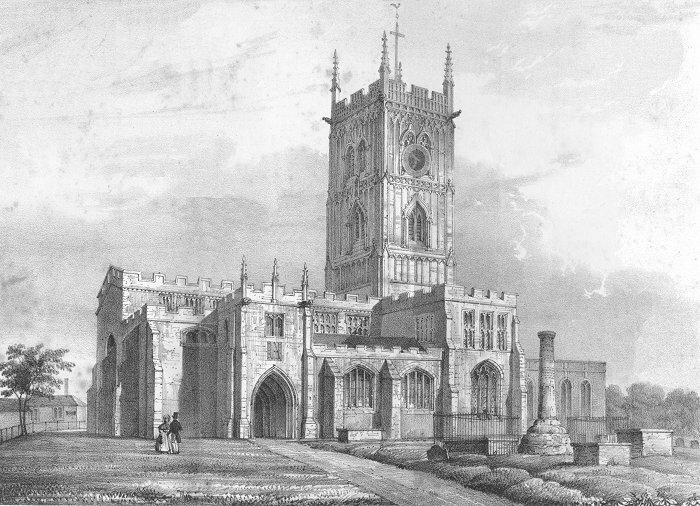 The church in the 18th century before the extensive restoration and rebuilding of later years. Note the old cross to the far left. If you are able to visit the church at night you will see that the church's history continues to develop, the rector before last having been responsible for the installation of a remarkable lighting system. Outside the church is illuminated at night as part of the city's "Out of Darkness Cometh Light" project. The church has long been a favourite with illustrators, whether artists or photographers. Their output includes a very large number of postcards. This drawing is by Wikes, who made his drawings of English cathedrals and churches between about 1835 and 1845. Note that the artist calls the church Saints Mary and Peter. The church (and monastery) was originally dedicated to St. Mary and some people revived the dedication in the 19th century. The hand colouring is modern and very well done but, as the church was built from locally quarried red sandstone, it should have a red shade rather than buff. Another view of the Church and the gardens as seen from across Lichfield Street. The gardens were originally part of the church's graveyard. They are was handed over to the town at the end of the 19th century and turned into gardens. The Horsman fountain, bottom right, is listed.